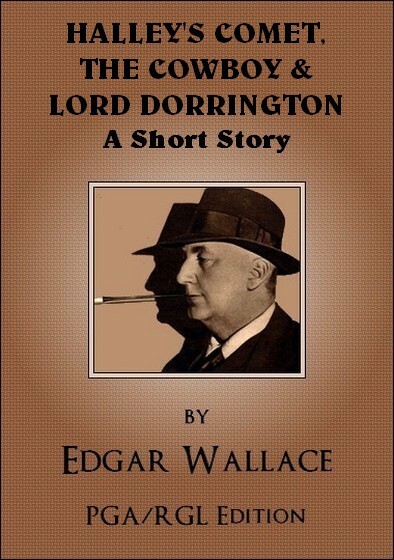 LORD DORRINGTON was a middle-aged man. He showed no evidence of mental decrepitude, and the alienist who was invited on one occasion to dine with his lordship—the invitation came from anxious relatives, who feared that, unless the poor dear fellow was placed under proper control, he would dissipate the fortunes of the Dorrington family—this alienist wrote so cheery a report upon Dorrington's health that the question of the payment of his fifty-guinea fee was seriously debated. It was felt by a select committee, composed of the beneficiaries under Dorrington's will, that the alienist had not done his duty. They called him (the alienist), disrespectfully, the 'mad doctor', and decided that his report upon Dorrington's sanity was a remarkable proof of the generally-accepted theory that all alienists become mad themselves—in time. The reason for their fears for Lord Dorrington's reason is understandable. He was an enthusiastic seeker after light. He was a spiritualist, a student of thaumaturgy, theurgy, electro-biology, and something of a Shamanist in an amateur kind of way. He believed that unlikely things happened. It was obviously absurd and unthinkable that even a little devil should condescend to consort with a mere butler, and Lord Dorrington very properly resented the assumption of his servant. Dorrington was a rich man and a shrewd man. The Dorrington belt was the eighth wonder of the world, as any guide-book to the castle will tell you. It was the belt presented by an English king to a lady who was the founder of the family. It was six inches broad, and made of diamonds—not large diamonds, but very saleable diamonds. The Dorrington strong-room was the strongest strong-room in England, for many people desired those gems, the market value being somewhere in the neighbourhood of £80,000. Lord Dorrington, as I say, was very practical in such matters, and where many a less fanciful man might have contented himself with phylacteries, his lordship, though a student of phylacteries, pinned his faith to doors of chilled steel and Chubb locks. It would occupy a great deal too much space to give at any length the number of attempts which were made upon those strong-rooms at Dorrington Castle. There was the still-room maid, who came with forged credentials from an eminent domestic agency, whose box contained diamond drills and a portable axe. There was the groom of the chambers, so suave and polite, with a hundred-pound 'kit' of well-tempered, safe-breaking tools. There was the Swiss valet, who was so very satisfactory until he was discovered one sad night walking cautiously in his stockinged feet in the direction of the strong-room. His explanation that, as a connoisseur of paintings, he desired an uninterrupted study of his lordship's 'Ribera Espanolito' in the east gallery was not accepted by a sceptical bench of magistrates, who gently pointed out that the skeleton keys found in his possession were not consistent with his statement. These and many others I could name. Whatever views his relatives might have concerning his mental balance, I am happy to say that in select criminal circles the acumen and intelligence of Lord Dorrington was held in the greatest respect. His companions in crime—they were dining at Figgioli's, in Conduit Street, and were beautifully arrayed—nodded their heads in approval. There was some justification for such arrogance, for Billy the Boy was a master of his craft, and one remarks, with a glow of national pride, that for scientific burglary England's old supremacy stands unassailed. I record this conversation that you may have a true appreciation of Lord Dorrington's contadictory qualities, and because he occupied a position of some fame a month or so later, and every scrap of information concerning him is of interest. He was, too, something of a biologist, but that has nothing whatever to do with this story. You may remember that the year 1910 was chiefly remarkable for the visitation of Halley's comet, and for the fact that the world passed through the tail of our celestial visitor. Now, in spite of lucid articles appearing over the signatures of eminent astronomers, and set forth prominently in the popular organs of public opinion, proving beyond doubt that you might take the tail of Halley's comet and fold the whole of it into a grip sack, there were hundreds of thousands of people who shook in their shoes at the mere thought of the phenomenon they were to witness. As one pseudo-scientific writer querulously pointed out, nobody had ever packed the tail into a portmanteau, so that it was ridiculous to say that such a thing could be done without creasing the tail and ruining it beyond repair. But the most important contribution to the literature on the subject was a letter signed 'Dorrington', which appeared in The Times. It began: 'There is something more than a material aspect to the approaching comet...' and went on to deal with the extraordinary happenings which had coincided with its appearance in former years. There were gross and sordid writers in Fleet Street who guffawed loudly on reading this; worse, they wrote sarcastic paragraphs and little poems, and generally shocked the psychic world by their levity. But their confusion came quickly. The comet came, growing brighter and brighter nightly, and, as the superb spectacle increased in splendour, the world began to take the comet more and more seriously. The earth entered the comet's tail on May 18th, and quite a number of people sat up all night destroying so much of their correspondence as, being recovered from the week of the world, might tend to make them look ridiculous. But nothing happened on the night of the 18th, and the sun rose on the 19th in very much the same way as usual. The busy world awoke, and went about its work. Factory horns hooted the toiling millions to labour, trim maids knocked at innumerable doors with tea and buttered toast, and the charwoman reigned supreme in the City of London. At 7.15, PC Albert Parker, of the City Police, came leisurely out of Shoe Lane into Wine Office Court. He turned the corner of the court, and came to a narrow stretch which leads into Fleet Street. On the left is the white-bricked wall of the Daily Telegraph paper store, on the right is the dingy facade of the Press Club. Lying between the Press Club and the far end of the court was the body of a man. 'Lying' is hardly the word, for he sprawled face downward, with arms and legs outstretched in spread-eagle fashion. PC Parker hastened his steps, and came up to the prostrate figure. It was clad in the most extraordinary garments. The trousers were of undressed sheepskin, with the woolly side outermost; a dark blue shirt was on his back, and round his neck was a gaudy neckcloth of great size. Under his baggy trousers he wore top-boots, and two large silver spurs stuck up, sparkling in the sunlight. Add to this a broad-brimmed hat, which lay at some distance from the figure, and a huge revolver at his side. The constable knelt down and felt the man's face; it was quite warm. He turned the figure over on its back. The man was breathing regularly, his heart was strong and normal; he appeared to be in a deep sleep. PC Parker frowned, and smelt his breath. No, he was not drunk, and the policeman shook the man by the shoulder. The man drew a long breath, sighed, and opened his eyes, blinking at the light. He stared at the policeman, and the policeman stared at him. The stranger was about thirty years of age; he was unshaven, and his face was covered with a faint coating of white dust. 'Gee!' he said, and sat up, scratching his head. Then he yawned, stretched himself, and rose a little shakily. 'Whar's that all fired hoss of mine?' he demanded sleepily. The stranger stared coolly at the officer of the law. Then he seemed of a sudden to realise that something had happened. He looked up and down the deserted court curiously. He allowed his eyes to wander along the buildings, then they came back to the policeman with a scared look. Then he passed his hand over his forehead wearily. 'I was goin' out to brand a steer,' he said, in a dreamy voice, 'an' that old light, she came prancin' over the prairie—she was a sure enough comet's tail, an' she hit me good. Where am I?' he asked suddenly. The strange sleeper staggered back. Four policemen, hastily summoned by a shrill whistle, hustled the cowboy—for such he evidently was—to the Bridewell, and two hours later, charged with being 'a suspected person' the man in the sheepskin chapperos came up at Guildhall before the alderman. ASTRONOMER-GENERAL SAYS IT IS IMPOSSIBLE. ...Another extraordinary fact is that when the man was taken to Bridewell his face and hair were covered with thin, white powder. The City surgeon, who was called to examine the man, took the trouble to brush some of this powder off, and submit it to analysis. It proved to be a fine alkaline matter, such as a man might accumulate in a ride across the alkali plains which abound in that part of the world from which the man said he came. Moreover, on being searched, he was found to be in possession of ten five-dollar bills, a Mexican five-dollar piece, some loose American money, and, most remarkable of all, a receipted hotel bill. The bill was for 'one night bed' at Golden South Hotel, in a town in Texas, and was dated May 17th, 1910. There was also a note of some laundry work done on the same date, and some thin hide laces, wrapped up in an American newspaper, which, although the title was undecipherable or torn off, has the date fairly legible, and that date is May 18th. This, and other evidence of the extraordinary character of the visitor, may be found in The Psychical Magazine, if it is not destroyed—but I rather fancy that that particular number of the publication in question has been burnt. It is no exaggeration to say that England talked of nothing else but 'the man the comet brought', and that there was not a psychical society in the world but hastily assembled to gather data upon the remarkable visitation. Excitement was at its height, when a new and even more sensational discovery was made. A sensational affair has happened at Eastergate, which has caused great local excitement. It appears that a number of horses from Mr Alfred Knight's training establishment were proceeding along the road in the direction of the downs, when the leading horse, Master Hopmoon, shied at the figure of a man lying by the side of the road. It is by no means a strange thing to observe tramps sleeping out at this time of the year, but the remarkable fact about the present case was that the figure was that of a Chinaman. The boy cantered back to where Mr Knight and his head lad were riding, behind the exercising horses, and informed his master. Mr Knight immediately rode forward and, dismounting, examined the man. Apparently the Chinaman was sleeping. He was dressed in the costume of his country, and Mr Knight informed our representative that the man was evidently one of the labouring class of China. As might be expected, the newcomer did not speak a word of English. He seemed dazed and terrified, and was with difficulty persuaded to accompany Mr Knight to the Eastergate Drill Hall, where temporary accommodation was found for him until the police were communicated with. Much greater difficulty was found in persuading him to get into the train at Barnham Junction, to accompany the police to Arundel. The man was in a condition of abject fright, jabbering and gesticulating as though he had never seen a railway train in his life. Fortunately, there lives in Arundel the Rev J. Wiggs, who has, until recently, been a missionary in China, and the rev. gentleman had no difficulty in conversing with the Celestial. So much for The Sussex Times. It was after that memorable conversation with the Rev J. Wiggs that the story of the Chinaman acquired a larger value. No man in England read that interview with greater interest than Lord Dorrington. He read it in the The Morning News, and straightway took a train for London, and thence to Arundel. 'What is it?' demanded Lord Dorrington, not unprepared for the answer. Later, Dorrington saw the Chinaman, very sullen, and showing as much evidence of his fear as his natural imperturbability of countenance allowed. Lord Dorrington returned to London to find a small crowd of reporters awaiting him at Victoria, to face innumerable cameras, and to answer a hundred questions. 'Do you think that these comet translations have occurred elsewhere?' demanded the reporter. The newspapers had, by this time, reversed their attitude of amused scepticism, and awarded Lord Dorrington's statement the dignity of leaded type. His prophecy, and the story of its fulfilment, appeared side by side, for, whilst his lordship had stood in the centre of the interrogating pressmen, the third, and, so far as can be ascertained, the last of the strange visitations, came. The third was even more dramatic in its circumstances than were the others. Dorrington had arrived at Victoria at 10 o'clock on the night of the 20th, which fell on a Saturday, and whilst he was giving his views on the phenomena with which all England was ringing, a curious scene was being enacted in one of the theatres. The curtain had just gone up for the second act of Our Miss Gibbs, at the Gaiety, and the stage was filled with beautiful women, picturesquely grouped, when there entered from one of the wings a figure which brought the play to an immediate standstill, which left the very conductor petrified with upraised baton. The figure was that of a man, of medium height and enormously stout. He was in evening dress, stained and dusty. His shirt front, in which glittered a huge diamond, was crumpled and grimy, and as he came waddling down the stage, rubbing his eyes and yawning, the immaculate chorus fell back on either side. He looked around with a puzzled frown, and then addressed a question to the actor nearest to him. The actor, who did not understand a word of Spanish, shook his head, and glanced appealingly to the wings, and the curtain was rung down amidst some excitement. This, indeed, was the third visitant! I am (says this document) a native of Brazil, although I cannot tell you what part of Brazil, for the time being, for I seem to have lost my memory. I arrived in Madrid on the night of the 16th, and stayed at the Hotel de Paris, on the Puerta del Sol. On the 17th, I believe, though I am not certain in my mind, I saw a man with whom I had some business relations. Who he was, or what was the nature of his business, I forget, but probably, when my head is less clouded, I shall recall the matter. The next day I spent in walking about Madrid. I have a dim idea that I went to the Prado, and that I spent some time admiring the old Spanish masters. In the evening I know that I dressed for dinner, and, the evening being a warm one, I went out without my overcoat, to the Casino. I left the Casino late. It must have been in the early hours of the morning but there were a number of people about and most of the cafés were open. I went up to my room and sat by the open window, smoking a cigar. It was then that over the houses, to the west side of the Puerta del Sol, I noticed a strange white light in the sky, resembling a pillar of white fire, which expanded in breadth visibly as I watched it. It grew broader and broader, and I pinched myself, thinking I must be dreaming. I sat with open mouth, paralysed, and the light grew fiercer and fiercer, till I felt it envelop me. I had no sensation of warmth, only a strange feeling of lightness, as though I could step through the window into the street below without hurt—and that was all I remember. When I awoke I found myself in a strange building. There was above me a skylight, which was open, and through which I must have fallen. I knew that I was in a theatre, for the curtain was raised, and the seats were all shrouded in holland, but I had no feeling of curiosity. All I wanted to do was sleep, sleep, sleep. I climbed over the orchestra on to the stage and wandered around, looking for a place in which to lie, for I was like a man drunk with sleep. Lord Dorrington steadfastly refused to receive any reporters, although some of the best men journeyed down to High Dorrington to secure his views. Saying this, his lordship ushered the Pressmen from the room, and returned to his strange investigations. We have not, unfortunately, the minutes of that inquisition, although it has been stated on most reliable authority that they covered reams of foolscap. We may guess that an irritated cowboy, a wondering but impassive Chinaman, and a most voluble gentleman from Mexico sat and suffered as Lord Dorrington, with the cold persistence of the enthusiast, extracted from them the particulars of their varying sensations. It was the night of the reporters' visit that the fourth and the most inexplicable of the comet's vagaries was recorded. The three men, after a lengthy examination, had retired to their separate bedrooms, and Lord Dorrington sat alone in his study, revising the notes he had made. Engrossed in his labours, he did not regard time, and time, utterly independent of Lord Dorrington's patronage, moved ruthlessly forward. Looking up, in a passionate attempt to find a synonym for 'extraordinary' and 'remarkable', his lordship was astounded to observe that the hands of the clock pointed to half-past two. He put away his papers, locked them in his desk, lit his bedroom candle, and extinguished the light in the study. Then he made his way along the silent hall toward the big stairway that led to his sleeping suite. Then, of a sudden, when he was half-way along the broad passage, there came a blinding white flash of flame. It leapt to him, and, as he staggered back, something struck him on the head, and he went to the floor like a log. Some say that he was stunned, but others aver that it was blue funk that kept his lordship lying on the floor of the hall until an early-rising servant discovered him, and assisted him back to the study. His first act—and here he showed the soul of the true scientist—was to send for the three men to compare their sensations with his. There came no answer to the knockings of Lord Dorrington's hired servants. An examination of the rooms led to the discovery that the men were gone. Their beds had not been slept in; there was no sign of their presence. Lord Dorrington stood before the door of the cowboy's room, a water compress about his head, wrapped in deep thought. The tremendous character of the new phenomenon impressed even him. He returned to his study, and sent thirty-six telegrams to thirty-six different newspapers, but the wire was in every case the same. THREE ASTRAL VISITORS AGAIN TRANSMIGRATED. I MYSELF HAVE EXPERIENCED POWER OF COMET. SEND REPORTER.—DORRINGTON. Long before the reporters could possibly respond to the invitation, a tall, clean-shaven man, with bushy eyebrows, came flying up to the great door of the Dorrington demesne, and demanded imperiously to see his lordship. He spoke with a strong American accent, and, when ushered into Dorrington's presence, nodded curtly. 'Gone,' said his lordship, staring at the man. 'Jewels?' repeated his lordship faintly. 'Jewels,' said the vigorous American. Lord Dorrington, supported on the arm of the detective, led the way to the strongest strong-room in England.